The following shows you how to estimate the amount of fabric needed to make a bedspread and comforter. All measurements are based on 54" wide fabrics (running yards). Remember, these are only estimates! Tips: Check the exact size of your mattress. Some manufacturers are currently either adding a few extra inches or shaving inches off "standard sizes". 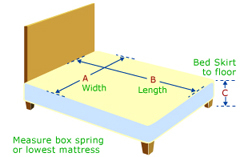 Also, mattress depths vary widely by manufacturer. Always pre-shrink fabric and trim separately before sewing. Twin (Double) : 54" x 75"
Finished Length - Length (B) + pillow tuck + drop (C). 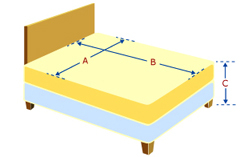 Measure from the top of the bed to the foot of the mattress. Then add one-drop measurement, and add the pillow tuck. Finished Width - Width (A) + drop (C) on 2 sides. 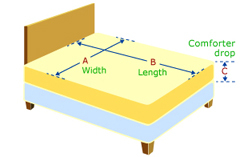 Measure from left side of mattress to the right side. Then add drop measurement for two sides. 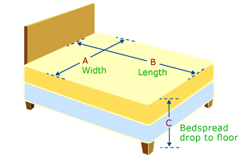 Drop - Measure from top edge of mattress to the floor or to where you would like the bottom of your bedspread to hang. Pillow Tuck - the extra length added to the bedspread so that you can fold the spread around the pillows. Standard is 15" for a twin & double bed, and 20" for queen & king. In the following chart, all measurments are in inches. The drop length is 21" and the pillow tuck is 20". Full : 96" x 116"
California King: 114" x 125"
California King: 96" x 116"
All measurments are for solid fabrics. Printed fabrics may require extra yardage. In the following chart, all measurments are in inches. The drop length is 13" and the pillow tuck is 0". Tip: Comforters do not come with a pillow tuck. California King: 98" x 97"
In the following chart, all measurments are in inches. The drop length is 14". California King: 108" x 98"